If you’ve ever suffered a missed flight or hours-long delay because of weather, mechanical problems, or even a computer system failure, you understand why travel insurance has become a popular must-have item among business travelers. Passengers may miss flights due to airline delays, spending a night either in the airport or a nearby hotel. They have to make new travel arrangements, cut trips short, or switch airlines to get to their final destination. Travel insurance won’t prevent this from happening, but there are certain situations that travel insurance would cover for you, such as reimbursement for meals and hotels, or new tickets, or even the purchase price of the plane ticket and hotel reservations. Travel can be cut short for any number of reasons — airline problems, sickness, death in the family, political unrest, strikes — so it makes sense to consider your options before you travel. 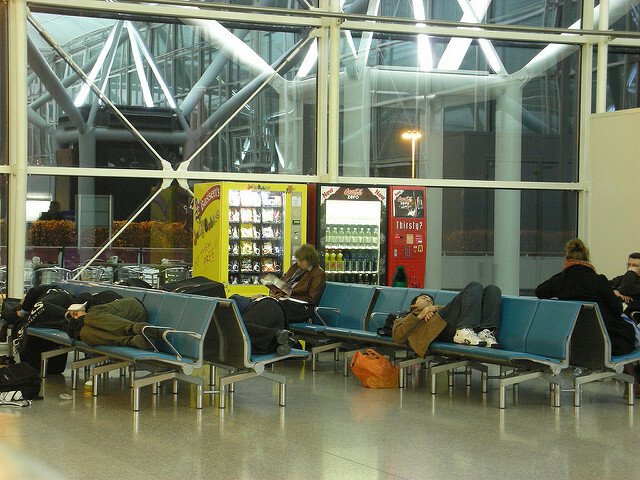 Without travel insurance, you may end up sleeping at the airport. Some credit cards offer insurance when you use it to buy your ticket, but travel insurance is not equal in their remuneration. So it pays to examine your options carefully before you buy insurance. If you’re wondering where to start, we suggest Squaremouth. The online site provides one-stop comparison shopping for all major travel insurance providers in the United States. It’s crucial that you read the language carefully before purchasing coverage so that you know exactly what is and isn’t covered. If you bought your ticket through a travel agency, many agents play a key role when an unexpected interruption in their clients’ travel plans causes headaches. In these types of situations, one of the perks of using an agent is that they will act as your liaisons with the insurance broker. Some travel insurance companies offer concierge service, which will handle procuring a ticket on another flight and making a hotel reservation while you are stranded, waiting to see what will happen next. Travel insurance policies can offer multiple, cumulative payouts for mishaps that occur during a single itinerary. For example, if your flight was delayed, and you were stranded on the tarmac for several hours, and your bags didn’t reach your final destination, all three of those incidents may entitle you to remuneration. That scenario netted one customer of Berkshire Hathaway Travel Protection Air Care $1550. If you didn’t purchase separate travel insurance, you might still be able to collect for an unanticipated inconvenience by enlisting the services of AirHelp. This automated service works with a team of lawyers to determine if your claim is worthy of compensation, and there’s no fee unless a claim is paid. Life happens. The unexpected can’t be avoided. But before you travel again, consider purchasing a little peace of mind to make the unexpected a lot easier to handle. Do you get travel insurance, or do you just fly and hope for the best? Share your thoughts with us in the comments below, on our Facebook page, or in our Twitter stream.